Coos Bay, Oregon- The inaugural Interstate Sprint Car Series Week Of Speed opened up on Monday, August 13th at Coos Bay Speedway. An incredible car count of thirty-drivers made the journey representing the states of Oregon, Washington, and California. Come main event time Harrisburg’s Tyler Thompson took the initial race lead at the drop of the green flag. Thompson set a torrid pace over the rest of the field with the only thing truly slowing him down being four cautions. The stoppages would come out at the perfect time on a few occasions right when some heavy lapped traffic was in front of the leader. 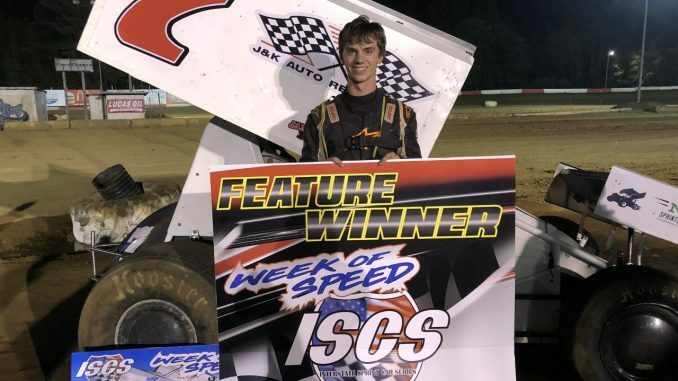 Thompson picked up the victory, his second straight with the series, becoming the first ever winner of a ISCS speedweek race and the first repeat winner of the season. Central Point’s Jake Wheeler scored a second-place result over Junction City veteran Shane Forte, in third. The rest of the top five would be made up of Bailey Sucich, from Granite Falls, Washington, crossing the wire in fourth while place fifth was Kyler Barraza, of Roseburg. Qualifying was split into four groups with Bailey Sucich, Tanner Holmes of Jacksonville, Tyler Thompson, and Monroe, Washington’s Jake Helsel setting fast times. Capturing victories in heat race competition were Shane Forte, Kyler Barraza, Springfield’s Mike Crawford, and Central Point youngster Blaine Cory. McKenzie Bridge teenager A.J. Harbaugh won the consolation feature. The ISCS Week Of Speed continues on Tuesday, August 14th, at Cottage Grove Speedway. The ISCS series would like to thank their series sponsors/marketing partners BC Motorsports, Highline Performance, NWSprintCarHistory.com, Champion Racing Oil, and Hoosier Racing Tires. For the latest news and updates regarding the Interstate Sprint Car Series be sure and visit their Facebook page.